This massive burger blows McDonald's and Burger King out of the water, as far as calorie bombs go. The Whole Hog Burger clocks in at an impressive 2,850 Calories. No, it's not from some macho barbecue place in Texas. It's from Chicago-style pizza chain Uno Pizzeria & Grill. Don't underestimate these pizza makers, though: the Whole Hog Burger is comprised of four types of meat toppings, four types of cheese, onion rings, and more. Because America. The Whole Hog Burger was featured as part of the Center for Science in the Public Interest's (CSPI) yearly Xtreme Eating Awards, a list that calls out the most atrociously unhealthy food items available in America. Calling out the Whole Hog Burger for its unfortunate nutritional value, CSPI said, "You might as well eat four McDonald's Quarter Pounders with Cheese and two medium fries doused with 18 packets of salt." So what's in this monstrosity? The Whole Hog burger contains, all told, over a pound of meat. 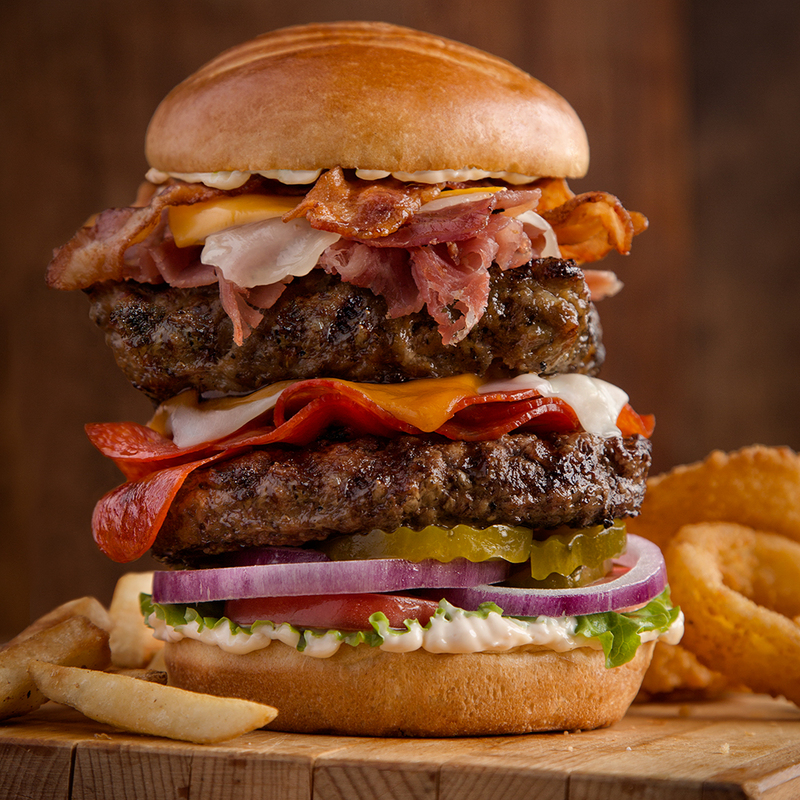 It's made up of a burger patty, bacon, pepperoni, sausage, prosciutto (which seems unfittingly fancy), yellow cheddar, mozzarella, Swiss and American cheeses as well as garlic mayonnaise, pickles, French fries, and onion rings. It's got almost a day and a half of calories (according to a 2,000-calorie diet), and six days' worth of salt in it, This bad boy is available at 129 Uno locations. As if one Whole Hog burger weren't enough, last March Uno had a promotion where, if you posted a picture of your burger to Facebook, you could win one free Whole Hog burger per month for twelve months. Assuming the first one didn't kill you of course.